The holiday season is a time when many of us embrace traditions, spending some quality time with our friends and families and enjoying the best that the season has to offer. While we might be a far cry from the picture of a white Christmas with frosted windows and a roaring fireplace, we can’t help but love some of our favorite traditions that aren’t bound to wintery weather. One of the best parts of Christmas are the traditions and stories. While we make our own every year surrounded by our loved ones, the poinsettia has a rich history and story of it’s own Christmas miracle – and how we came to love it far from its native home in Mexico. The rosy-colored plants are known for their blooming habit in the middle of winter, where they decorate the roadsides in the temperate forests. The story goes that a poor girl was looking for a gift to lay at the altar during the Christmas season, but could find nothing but a bouquet of green weeds she found on the roadside. Although the wealthy church-goers laughed at her modest gift, the weeds began to bloom in gorgeous shades of red when she offered her gift – a miracle to reward her true and honest generosity. 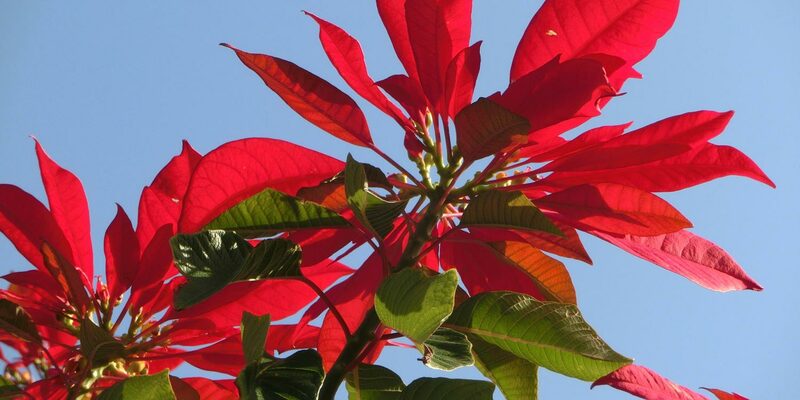 Ever since, the roadsides have been blessed with the stunning display of poinsettias every Christmas since – earning them the nickname ‘Flores de Noche Buena’ (Flowers of the Holy Night). Modest roadside beginnings or not, the poinsettia caught the eye of Americans in the 1820s and has since become a beloved Christmas tradition – despite false rumors that claimed it was poisonous. It is a stunning way to welcome in rich shades of Christmas colors at this time of year, with the delicate and exotic appeal of a gorgeous tropical plant. Despite many Americans associating the poinsettia with their chilly winter season, our comfortable South Florida climate offers the ideal conditions to actually enjoy the best that our poinsettias have to offer us! Poinsettias offer that beautiful finishing touch to your Christmas decorations with centerpiece-quality style. Traditionally, the plants grow in beautiful shades of deep green with scarlet petals on their broad, tropical foliage. While this Christmas-themed color scheme is still a popular favorite, it’s easy to find other gorgeous variations offering other shades, shapes, and colors to fit anyone’s particular seasonal look with style and grace. 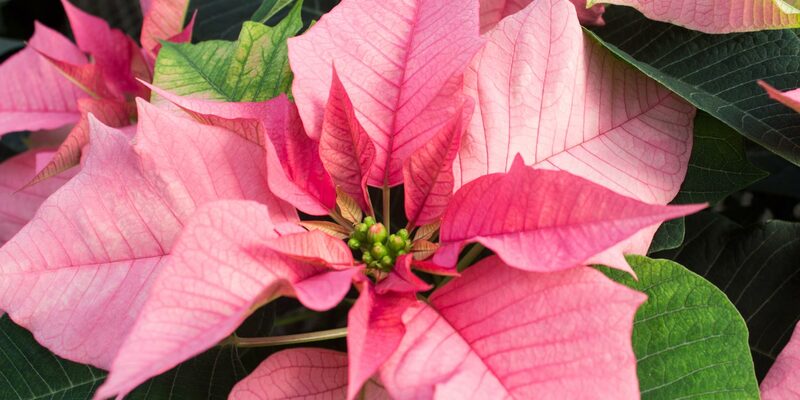 To ensure that you have a gorgeous and hassle-free poinsettia for the duration of the holidays, it’s important to choose a plant that is healthy and vibrant. This will give you a reliable holiday plant that is ready to dazzle in your decor without any headache. Choose a plant that stands out with superior color and quality. The best and healthiest poinsettias have rich colorings with deeply colored leaves. Look for a plant that is broad and well-branched, rather than a spindly, pale, or lanky one. Avoid plants that have any yellowing or curled leaves on the lower stems. Yellowing or curling leaves are possible signs of root rot, which is a fungus that can occur when a poinsettia is overwatered. This is an important sign to watch for at home, too, as you care for your Christmas plant, to keep it looking its best for longer. Only water your plant when the soil is dry to the touch. Choose a plant that is still young so that you have more time to enjoy it at home. Younger plants will bloom enthusiastically through the holidays, rather than quitting a week before the festivities are done. A poinsettia that has open blooms and black pollen tips is near the end of its shelf life, whereas a specimen with some closed buds or open blooms with bright yellow pollen tips will give you more time to enjoy it at home. A healthy poinsettia brings a picture-perfect Christmas look to any home and keeping it healthy is key to having it stay stunning for as long as possible. Many people struggle with their poinsettias from over-doting, so it’s a relief to hear that keeping your plant healthy might actually mean doing less. 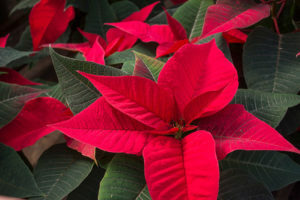 While you might want to focus on keeping your plant in showcase condition, you can actually sit back and just enjoy the show – and the rest of the holidays – as your poinsettia will mostly take care of itself. Give it the occasional drink of water when the soil is dry and that’s all it will take to keep your poinsettia in tip-top shape! We simply want the best during the holiday season, and poinsettias are a sure way to charm family and friends alike with festive and luxurious colors. A touch of exoticism in our homes amidst all the wintery decorations, these tropical plants are a wonderful compliment to anyone’s Christmas decor, as well as a wonderful marker of the beginning of the Christmas season when they make their way into our homes once again. All the baubles, ribbons, and decorations in the world simply can’t compete with this stylishly featured living tradition!